I hope that you know how to create magento module and I will skip this step. In this system.xml file we create options for this payment method. These options you will see in admin section under payment method, also if you need additional options you can add them. If your method redirect when customer click on checkout button place order you have to create (customcard/standard/redirect) standard controller with method redirectAction and etc. This page will create html form which will send POST data to payment gateway. All data which you need for creating this form you can get from Magento model $session = Mage::getSingleton(‘checkout/session’); and etc. It not show on frontend how to show that on frontend side? Can you please help me about this. Hello, nice work 🙂 Do you maybe have complete source code? could you please share the knowlege that how magento processing the right payment gateway details from the radio selection. What are the rest process for that? My payment module is not visible on front end. and why did u leave this aspect in your tutorial. what is the use of a service when one cannot use it. means module won’t appear on front end this way. and even no tutorial like this is on your blog. why is that so? it must be a tutorial series. its in complete sorry. Please help me urgently with this. Hello everyone, Can any one tell me that how can i add a field of payment method logo just like title, when we write any thing in title its displayed in frontend on checkout and i want to add a field of logo so i can add a image and it should displayed in checkout page. 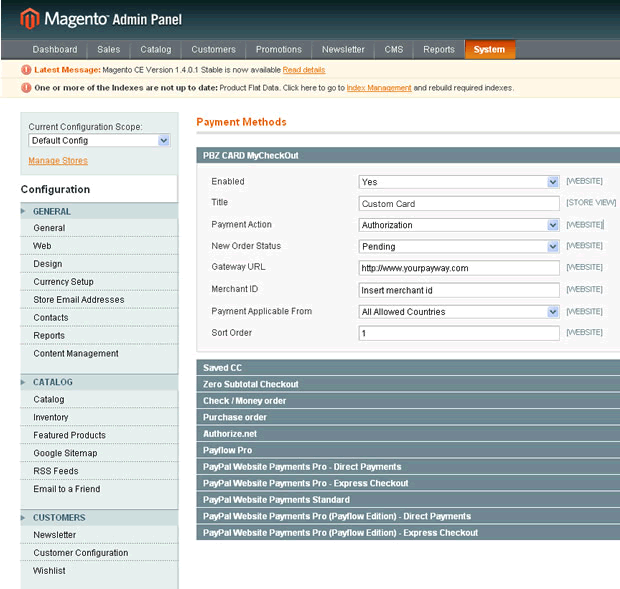 Sir can we add all active payment method in registration page also in magento ? Someone knows how to do to show this new payment method in the checkout? please! Great help, thanks. Tested it with Magento 1.9. I need your support friends! I have a payment method extension. This generate a Token URL for finally redirect at shopper at gateway. Optional. Send automatically payment instructions at Shopper’s email. * The second group for basics fields and enable a new service using the credentials of first group. A very big unnoticeable bug exists here. Hello, This is a grate Tutorial. There is Authorize.net module in Magento. I want to Create my module and call method of Authorize.net for payment from my module. Is it possible? First, I appreciate you and thank you to for writing such brilliant tutorials. This solution is not working with magento 1.7 in my case. Will you please give me any guideline for implementing it in magento 1.7.
please am new to magento can any one show me in details how to get this payment gateway to work i cant really get it right. I have my model configured. When I place any of the payment action method which are capture, initialize or authorize. I get error on Payment gateway selection page. Note: I do not have Payment Action option available in my configuration section. Is that required? Hello Domagoj Potkoc can u tell me is magento store order in databse before payment or after payment. We like to integrate a payment module for creating admin orders which uses third party transfer. When we try to create the order, it gets placed without redirecting. Is it possible to make this in magento ? If so please guide us to move forward. Is it possible to create a magento module in ASP.Net using C#? If yes how? Aren’t there some parts missing here – like for example where do I put HTML which shows up when user selects my new module in checkout? hi, Im half way though using your invaluable tutorial. My payment gateway sends back the response to a URL which I can specify. Can you show me how to capture that and update the order status using this module please ? Put this at top, this will prevent a FK from preventing your script completing. I would bare in mind this is a quick and dirty fix, there maybe be something wrong with your Magento install. Please guide me to solve this. Many kudus for very informative blog entry. How can I add online and offline refund options from admin for a particular payment gateway? If you could provide any type of help I would be highly grateful.